Here’s the premise: Pete (Mark Wahlberg, MILE 22; DEEPWATER HORIZON) and Ellie (Rose Byrne, SPY) Wagner are a happily married, barely 40-something year old, couple (um, Wahlberg is 47) who have a successful business buying older homes, renovating them and then selling them. Although Pete had wanted to have children, the time was never right for Ellie and life just seemed to take over. Now that they’re financially secure, Ellie is having second thoughts but Pete doesn’t relish the idea of starting a family at this point in his life. Jokingly, he says to Ellie that if they could start with a 5-year-old, he’d be on board though. That gives Ellie the idea for them to become foster parents. The couple decides to join a community group of prospective foster parents organised by child welfare social workers, loose cannon Karen (Octavia Spencer, THE SHAPE OF WATER; HIDDEN FIGURES; FATHERS AND DAUGHTERS) and by-the-book Sharon (Tig Notaro, TV’s TRANSPARENT), and eventually they agree to take a feisty, 15-year-old named Lizzy (Isabela Moner, SICARIO: DAY OF THE SOLDADO) into their home. She, though, comes as part of a package and the family of two immediately becomes a family of five with the inclusion of Lizzy’s younger brother and sister, the schlemazeldik and hypersensitive Juan (Gustavo Quiroz) and the bratty Lita (Julianna Gamiz). While things start off surprisingly well for them all, it doesn’t take too long before the kids start pushing all the adults’ emotional hot buttons. The Wagners, though, manage to keep the kids in check by showing that their love of them is both real and unconditional. 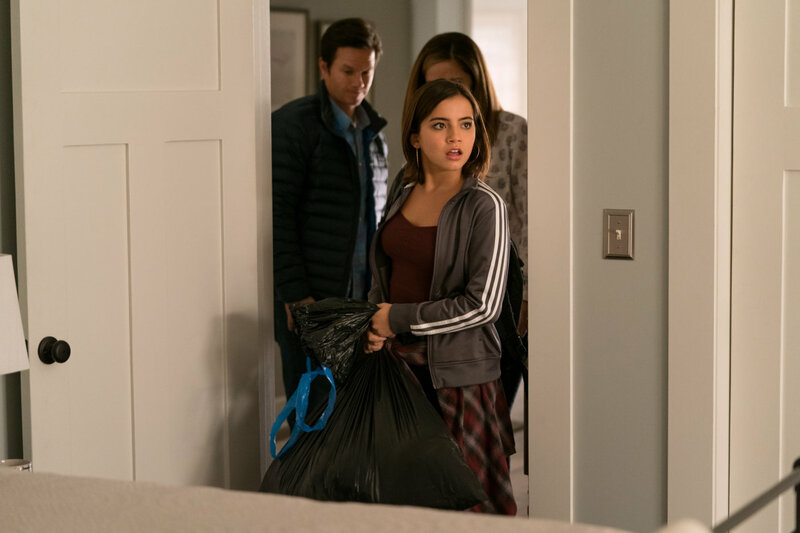 Based on the real-life experiences of co-writer and director Sean Anders (the DADDY’S HOME films and HORRIBLE BOSSES 2) and his wife who adopted three children through the foster care system, INSTANT FAMILY plays much like a public service announcement. (Apparently, where the film is playing in the US, a helpful website is even listed in the end credits.) The film’s other foster parents include a mixed-race gay couple, a devoutly Christian couple (who are fodder for many of the film’s jokes), and an uptight single woman who wants to foster an African-American boy so that she can provide him with the opportunity to excel in sports and become a professional athlete. In other words, not only can anyone become a foster parent these days, for financially secure Gen X-ers who aren’t into 2 am feedings and changing diapers or who don’t want to spend the time going through the traditional channels for adoption, taking the foster parent route to adopt is the answer to their dreams. Forget about the fact that many people take foster children into their home as a business. Call me old fashioned but isn’t the goal of foster parenting to provide a stable and secure home life for these kids until they can be reunited with their parents or mothers? Why are people being encouraged to foster with the intention of adopting these kids later on? Isn’t that setting both these parents and the children up for failure down the road when the birth parent does come back? I realise that many birth parents don’t or can’t come back into their children’s lives for various reasons and foster parents do decide to adopt these kids but why make it seem that this is now the norm rather than the exception? As well-intentioned as the film is, my jaw was hanging open for most of this movie, though I did manage to close it a couple of times and even chuckle at the situational humour that resulted from the arrival of Pete’s mom, Grandma Sandy (Margo Martindale, DOWNSIZING; AUGUST: OSAGE COUNTY). Martindale is the film’s bright spot, stealing every scene she’s in. For the rest of the film though, I was just shaking my head that almost everyone else in the cinema was lapping it up and loving it.